Wisconsin Historical Society Press, 9780870207716, 124pp. 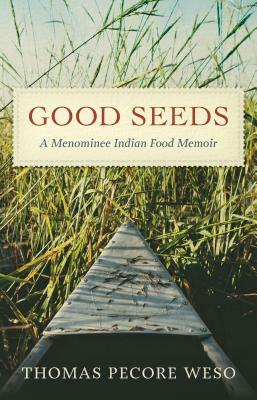 In this food memoir, named for the manoomin or wild rice that also gives the Menominee tribe its name, tribal member Thomas Pecore Weso takes readers on a cook’s journey through Wisconsin’s northern woods. He connects each food—beaver, trout, blackberry, wild rice, maple sugar, partridge—with colorful individuals who taught him Indigenous values. Cooks will learn from his authentic recipes. Amateur and professional historians will appreciate firsthand stories about reservation life during the mid-twentieth century, when many elders, fluent in the Algonquian language, practiced the old ways. Weso’s grandfather Moon was considered a medicine man, and his morning prayers were the foundation for all the day’s meals. Weso’s grandmother Jennie "made fire" each morning in a wood-burning stove, and oversaw huge breakfasts of wild game, fish, and fruit pies. As Weso grew up, his uncles taught him to hunt bear, deer, squirrels, raccoons, and even skunks for the daily larder. He remembers foods served at the Menominee fair and the excitement of "sugar bush," maple sugar gatherings that included dances as well as hard work. Weso uses humor to tell his own story as a boy learning to thrive in a land of icy winters and summer swamps. With his rare perspective as a Native anthropologist and artist, he tells a poignant personal story in this unique book. Thomas Weso is an enrolled member of the Menominee Indian Nation of Wisconsin. He is the author of many articles, personal essays, and a biography of Langston Hughes with coauthor Denise Low. Weso holds a master’s degree in Indigenous Studies from the University of Kansas, and has taught at the college level for the last fifteen years. He is a speaker for the Kansas Humanities Council library program, Talk About Literature in Kansas and copublisher of Mammoth Publications. He is an artist with paintings in collections throughout the Kansas City area, and he has had solo and group shows at the Hutchinson Arts Center and other venues. "Weso tells his tale of Menominee history that began with his family in a house that had been an Indian service jail. There is necessary information here- diesel fuel gels at 40 below. Pines burst at 20 below. One grasps at once that Good Seeds, rooted in the Midwest, at the same time transcends the region with its strong transnational focus. The book is local, state, regional, and international history.